Gav wins Bristol's Best Dressed competition and somehow Ricky becomes a viral fashion sensation. The gang hold a recycled catwalk fashion show. Browse content similar to Day of the Fashion. Check below for episodes and series from the same categories and more! I'm Ricky, I live in Bristol. I work as an animator, which is lucky, because I love art. I live for art. I even dream of art. I draw, I paint, I make things. I hang out with my mates, Gavin, Rich and Sarah. -Most importantly, I make ninja moves. Today I'll show you how to make a sock dispenser that's pretty sweet. animation that will send you barking. It's a new day. I'd better get my ninja on. Are you not going to congratulate me? For what, wearing ridiculous clothing? I think not. Catch you later. If I don't ask him what he's up to, he won't go away. It doesn't get weirder than that. -The annoying best mate of the Art Ninja. So, things do get weirder. I can't believe Gavin won. Now I've got a much better idea of something you can do with fashion. It's the Art Ninja gumball sock dispenser. I've got a big bit of card here. I'm going to draw out the main shapes that make my sock dispenser. I'm starting by drawing the front. are going to roll out. And the back. This is going to be my little ramp for the socks to roll down. salad bowls, I'm going to draw around it to make sure it fits. Now, I need to cut these out, but I'm going to use my ninja skills. Here is the back of my dispenser. I'm going to make some sides using a long piece of card. folding it up at a right angle. Once it's stuck nicely, fold it round the edges. Some more masking tape to hold it in place. Fold round the other edge. Now I'm going to put in the ramp. And when the socks drop down, this will help them roll out. I'm going to make the spindle which is the turn-y bit. For that I'm going to use a cardboard tube. and wrapped in masking tape so they're nice and thick. I'm going to glue these on the side of my spindle with some strong glue. You'll need three of these. And I'm going to hold them in place with some masking tape. And I'm making sure I'm sticking these down equally spaced. Then I'm going to pop on the front. And I'm going to hold this in place with some masking tape. There we go. Now I'm going to put on the top. That's the main body of my sock dispenser. The little turn-y bit going in there. I'm going to give it a lick of paint. make sure you put down some paper to protect your surfaces. they're going to be painted silver. Painting the ramp on the inside. Now I'm going to move onto the silver. Because the masking tape isn't painted, the silver shows up better. I'm also painting the spindle silver. Now the paint is dry, I'm adding some details with a black pen. I'm making these areas of silver paint look like strips of metal. I'm doing that by adding little circles that look like rivets. All right, now it's time to make the clear ball that holds the socks. I'm making it from two recycled salad bowls. and to the inner ridge on this one. plastic can be quite sharp. I'm going to stick these together with some strong glue. I'm going to glue it to the top of my dispenser. ends of my roll. Now it's time to add some socks. I've also made a lid from card circles and masking tape. Right, let's see if it works. Can't decide what socks to wear? Let this little gadget decide for you. You don't have to make this gumball sock dispenser. I predict that you could make this mystical fortune-telling dispenser. Turn the handle to predict your future. Or how about this alien dispenser? It's a real space saver. I'm so annoyed at the Bristol Best Dressed thing. I'm going to write a strongly-worded e-mail to the organisers. Oh, hey, Sarah, what are you doing here? I was a judge for Bristol's Best Dressed Personality. I think we might have made a terrible mistake. That is an incredible look. I need to call the other judges. -They need to hear about this. -Oh, this is so now! 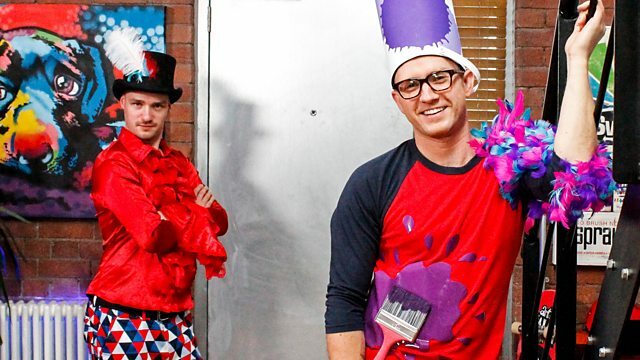 I can't believe they think the Paint Pot is fashionable. Are you one of the judges for Bristol's Best Dressed Personality? Dame Vivienne Westwood and I've been dressing Britain for years. I do beg your pardon, Dame Vivienne. and helped come up with the look. In one of my fashion creations, I even used a toilet flush! Punks are all about doing what you want. Could you design something from me? You'll have to join the queue, I'm afraid. Well, I guess I'll have to design something myself then. -Don't be a fashion victim. I'm going to design some punk patches. I'm going to start by cutting out three squares from these old jeans. You can pick up some cheaply from a charity shop. I'm going to fray my patches to give them a punk look. neat, you can distress it as much as you like. in a kind of a anarchic zigzag pattern. It will really make my designs pop. I'll get some print outs to transfer onto my punk patches. There's Gav, a unicorn, and a guitar. And I've printed out the word "cool" but the letters are backwards. because I want the edges to be straight but a little bit rough. And on this one, I'm going to tear it a bit rougher with my fingertips. This one, some scissors to give a zigzag design. I'm going to glue my pictures onto my patches face down. I'm using lots of PVA here. Lots of PVA over the top. I want these to be perfectly flat to my patch. It might seem a bit strange but all will be revealed. Right, now for the letters. so that when you transfer them, they'll be round the right way. you need to put down first. Put Gav over the top. Bye, Gavin. I could wait for these to dry but I'm going to use my ninja skills. I'm just going to wet my fingers and then rub the paper. it rubs away the paper but leaves behind the ink from the printout. I can see Gav's face emerging. and it makes the colours really vibrant. Now that one's done, I need to do the same technique on the other two. But I'm going to use my ninja skills. There we go. Check 'em out! using safety pins just like Vivienne Westwood. Be careful if you're using safety pins because they can be sharp. I think I've got this fashion designer thing...nailed. is getting loads of likes. Everyone's wearing the Paint Pot. Who'd have thought my look would go viral? It's clearly moved a lot of people. Something else that moves is this picture. Oh, you all right, mate? -What's that you've got there? He ran around a tree. He ran over the field. He did a cartwheel over a stream. He jumped on a trampoline. Then he was abducted by aliens! Don't worry, mate, it's just an animation. some masking tape, a camera, and if you like, a Gary. You can put it together in just three ninja moves. You need to draw out a nice big scene. This can be anything you like. Now to draw your character inside your scene. flapping paper. Now, draw your next frame of animation on this flap. flap over the top so it's hidden. Now you have to do this for every single frame of the animation. anything you like, literally anything. interesting, I've made them flap over in different directions. Now it's time to shoot your animation. This bit can be a little bit tricky. You might need to get a friend to help you but take your time here. What you really want here is a nice smooth video. we've speeded it up a little bit. I think it's time to take a look at our mini masterpiece. Oh, yeah, what did you think of that? -Well, do you notice anything different? -Have you clipped your nose hair? I'm wearing the Paint Pot. Yeah, yeah, it's a good attempt. Hi, Ricky, it's your mum. He's made a right mess in the house. -I saw your picture in the news. You're quite a style icon. And there's plenty more art to come in that fashion. The Grand Master embraces style with a woven bracelet. you turn trash to style treasure for a cover shoot like no other. Wait till I see your dad, he's in trouble. See him? You can't miss him! I wonder if the ninja apprentices are wearing the Paint Pot. Maybe it hasn't caught on yet. Hey, it's Lauren and David from Got What It Takes. Ricky, have you got what it takes to make art with a microphone? No, but I can sing a note that will break this glass. -Maybe you should stick to art! Oh, it's a bad line. Ricky, what can you make with a remote control? Sorry, I can't channel any ideas right now. Hey, what have these guys got? Ricky, can you make art with a pair of old tights? It's a bit of a stretch but why not? I choose you. -So, what are your names? -And where are you from? Well, it's a great suggestion. Let me just go and grab some bits. a couple of paints and some bits of paper. We'll get onto that in a moment. Some card and a stapler. I see a lot of art behind you guys. What's that long green one at the top? It's a football pitch I made. I'm just going to cut the foot off one leg of the tights. I'm going to cut down it to make a flat piece of material. I'm going to be using the tights to make a screen print. I'm going to stretch it out and staple it around my frame. Let me stretch it round. It's a little bit fiddly so you might need to ask for some help. And obviously ask somebody if you can use their old tights! otherwise the screen print won't work. so I'm going to ninja another one. Ya! -And people say I have no style. going to use that to create my screen print. and the chocolate stick onto the tights. Mint choc chip? That's a good flavour, and a lovely colour. I've drawn around the cone and the chocolate stick. Now I'm going to move on and do the ice cream on this second frame. different parts of the picture. I'm going to paint around the outside of the shapes I've drawn. I've got a tray to protect the table. Cos it gets quite sticky. so make sure the glue is nice and thick. I'm going to paint all the way up to the edges. painting glue around the shapes that I've drawn. so I'm going to use my ninja skills. the paint will go through the tights to print the picture. So I've got a piece of folded card here. I'll put my cone and chocolate stick over the top. I'm going to add some yellow to the top. Using a piece of card as a squeegee, I'll spread it down. so the paint goes through the tights. Now I'm going to add on the ice cream. Carefully lining it up with the cone. It's best to do this when it's dry. So it's strawberry ice cream, I guess. I'm pushing the paint through the tights again. Yes! Do you want to see it? -I've made an ice cream greetings card. So, what would you score it? We give it a ten. It was a great suggestion. Wow. I'm so fashionable, it hurts. Hey, Gav, are you here to get restyled as the Paint Pot as well? The Paint Pot look is already so last week. It only started this morning. So, if that's out, what's in? We can work on that but first, let's get our catwalk on. Gav, the catwalk loves us! Now you just need to find a new look. Here's a quick art tip of how to draw a washing line. and that's where they're going to come from. These poles are very, very thin long rectangles. I'm going to draw them leaning away from each other. A little tie on either of them. That's where the washing line is going to hang. because, of course, it's holding heavy, wet clothes. A couple of pegs. A couple here, too. Now I get to draw the clothes. I'm going to start with a T-shirt. With two sleeves either side, it's kind of like a fat-bodied T.
And the collar and details there for the sleeves. A pair of trousers. Two legs. Draw the pocket details in. Tops. Of course, the flies. How about some trendy turn ups? There we go. A pair of Y-fronts. It's really the detail that defines each of these garments. Now a couple of socks. There we go. There's a quick art tip on how to draw a washing line. I don't think you'll find anybody but you wearing that. That's the number 2018 to enlightenment. Organic adornment for your carpus. A woven bracelet for your wrist. Grab three straws, dude, and wrap sticky tape around one end. and start weaving the wool between them. Keep weaving back and forth, dudes. When you fancy a change, cut off the wool and add another colour. Just tie it to the last one, dudes. Do as many colours as you like, man. Cut off the wool, then grab a skewer and three lengths of wool. Poke a piece through each straw with the skewer. Carefully slide the wool off the straws. Tie off this end. And tie the ends together! That's a number 2018 complete. I can't believe the Grand Master has his finger on the fashion pulse. Me, too. Remember, I am Bristol's Best Dressed Personality after all. Bye then. How am I going to get my fashion mojo back? I guess I don't need this any more. -My Paint Pot look went viral and now Gav says it's over. -I think I might be able to help you out. Better not forget this little accessory. I see you've ditched the Paint Pot look? Yeah, I thought I'd go with this fashion classic. Maybe it's in fashion at the skate park but not on the catwalk. This is Adnan, he's going to help you get your fashion mojo back. Well, in that case, lovely to meet you. Adnan is a top fashion designer. He uses unusual materials to make couture clothes. but first, we're going to get our ninja on. Strike a pose. And a pose. the House of Art Ninja, what materials would I need to buy? None. I like to make clothes out of recycled materials. We need to open these boxes. -Can you cut some long strips for me, please? -Sarah, I need eight of these. So, what are we going to do with these? Well, we're going to build a cage around this mannequin. and just pin it in like that. It doesn't look much like a piece of clothing. It's looking good. So, what's next? We're going to make a ninja spinner. There you go. I'm going to need a load of these, Ricky. All right, I'll just ninja some more. You get some colour on this and I'm going to help Sarah. -Let's get some colour on it. Great! Here's a finishing touch. Let's get you in the outfit. While Ricky's getting changed, let's get this camera warmed up. Love this one from recycled fabrics. And a recycled paperclip dress. Nice! That's it, work it. Come on, Ricky, it's your turn. I can't wait to see it. Come on, then, give us your best poses. The fashionistas are going to love this. Finally, I've got my style mojo back. It's time to strut this stuff on the catwalk of life. Real cool, Ricks, real cool. The fashion industry moves so fast, it's hard to keep up. I never want to be a fashionista again. -Nice pyjamas. Check out that bedtime look! Art Ninja goes Trend Ninja when Gav wins Bristol's Best Dressed competition and somehow Ricky becomes a viral fashion sensation. He makes a gumball sock dispenser, punk patches inspired by Vivienne Westwood and a card using a pair of tights. But when he loses his fashion mojo, Ricky and the gang try to get it back with a recycled catwalk fashion show.